There is plenty of precautionary measures you can take to ensure you stay safe when tackling an interior painting project. Are you a novice when it comes to interior painting? People don’t realize that are quite a few safety hazards when it comes to a standard interior painting project. Believe it or not, there are plenty of people who harm themselves every year trying to paint. There are plenty of precautionary measures you can take to ensure that you stay safe. 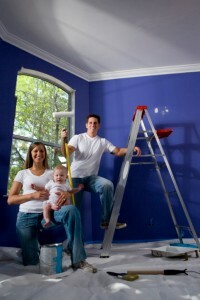 Here are some safety tips that should help you with your next painting project. This is mostly in reference to your hands. It is important that at you use the appropriate gloves when tackling an interior painting job. If you are going to be sanding, you are going to want to wear leather or cloth gloves. If you are going to be using a solvent-resistant product, you will need to be wearing solvent-resistant chemical gloves. It always a good idea to wear protective eyewear while painting. You could either opt for a face mask, goggles, or glasses. This is especially true if you are painting a ceiling because paint may end up dripping on your face. There is no reason why you should be breathing in paint fumes when you don’t need to. To avoid this, all you need to do is wear a mask when painting. You will also want to wear a mask when you are sanding any surfaces because you also don’t want to breathe in any wood/dust particles. You need to be extremely careful when using paint sprayers. Paint gets shot out at a tremendous speed and can easily cause injury. It should go without saying that you should never point the nozzle at yourself or anybody else.